This metal, handheld Swingline 1-Hole Paper Punch is useful at home, school or work and is great for traveling. This paper punch can punch up to 5 sheets of paper and creates a 1/4" hole. 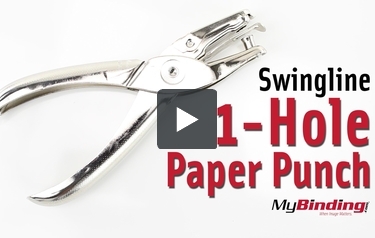 This Swingline 1-Hole Paper Punch has a paper chip holder that makes clean-up fast and easy. Transcript: This is the Swingline 1-Hole Paper Punch! It punches a single hole into your pages—the hole measure to a standard 1/4” an inch. Swingline says that it can punch through 5 holes at a time, as seen here. It’s plenty easy, so I tried 10 and it did just fine as well. Though the more you do, the more difficult it gets, and the more likely it is to get stuck, too. It collects the waste as well, so after use, empty the catcher in the trash. It has a throat depth of 7/8” as seen here. Though you can punch a hole at any depth between that. This is the Swingline 1-Hole Paper Punch! And here is just a final look at the punch.